Who dares to challenge Zenco the Magnificent, master of cards? At a game of his own creation, no less! Dueling Decks is a game of head-on competition, in which the players face off with cards featuring famous figures of Neopian lore... and Zenco knows all the tricks. I challenge you to... A children's card game! When the game begins, you will be asked to choose a difficulty level. While the gameplay remains more or less the same in each mode, the increased difficulty will make the game considerably harder. For more on the differences between the difficulty levels, see the Scoring and Strategy sections below. To play the game, use your mouse to select one of three attributes on the card in your hand. 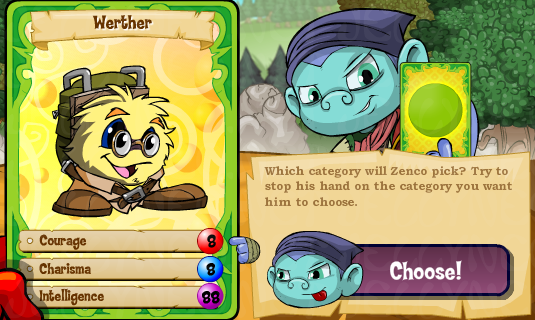 If the attribute you chose has a higher number than the same one on Zenco's card, you will add both of the cards to your deck; if his is higher, he will take them. In the event of a tie, both cards will be set aside and given to the player to win the next hand. The goal of the game is to collect the entire deck of cards, and you will lose if Zenco does the same. Regardless of who wins, you will be able to send your score. At any time during play, you can click the Play Wildcard button to switch your current card out with Nightsteed, whose stats are well above average. This can only be done once per game, so should be used when you think you're on the verge of losing. Of course, with Ylana Skyfire you don't even need that musty old Nightsteed. The attributes listed on the cards are Courage, Charisma, and Intelligence. These reflect the personality of the character shown on the card, and can vary greatly. In order to choose an attribute higher than Zenco's in each round, you should consider the strongest trait your character has; that is, which one is least likely to be beaten. The easiest way to figure this out is by comparing the attributes on your card to the high, low, and median of all cards. The median is the number in the middle, an equal distance from the highest and lowest numbers. To have the best chance of beating an opposing card, you should choose a stat higher than the median; if you choose one that is lower, you're likely to be beaten. The minimum, median, and maximum numbers found on all cards in the game, with the exception of the Wildcard, are as follows. While it's useful to keep the average attributes in mind, with some cards it can be difficult to decide how to play. Other cards (we're looking at you, Gorix) have such low numbers that you're almost guaranteed to lose with them. There are forty-one different cards in Dueling Decks, twenty of which (not including the wildcard) are randomly chosen for each game. The table below lists all forty-one cards, along with a recommendation of which attribute to select. Scoring in Dueling Decks is based on how many hands you win in a row, with the points awarded doubling for each consecutive win. Once you've reached five wins, as shown on the combo meter in the upper-left corner of the screen, your wins will be reset and you will get a "bonus awarded" notification. While this feature supposedly awards extra points, it does not currently seem to be working. The number of points you receive for each winning hand will vary depending on the difficulty level you select at the beginning of the game. The Hard difficulty grants twice as many points as Normal, which in turn grants twice as many as Easy. Due to this, if you're trying for a high score in the game, it is recommended that you play on Hard. In Easy mode, you will always have the choice of which attribute is played, regardless of who won the last hand. This gives you complete control over the game, though as seen above, you will receive the smallest number of points. In Normal mode, should you lose a hand to Zenco, he will choose which attriute to use next. You can, however, influence his decision with a roulette-like game that scrolls through the attributes; click the Choose button when it's pointing at the option above the one you would like for the best chance to select it. In Hard mode, losing a hand will give Zenco full control over which attribute to choose. He's quite good at selecting a card's best attribute, so it could be several rounds before you're in control of the game again. Despite this, it is recommended that you play on Hard, as it awards the most points and can be played more quickly than Normal. While winning a game of Dueling Decks isn't terribly hard, getting a high score requires time and determination. In order to gain a score in the tens of thousands for a gaming event or to reach the high score table, you must repeatedly collect the majority of the deck, then allow Zenco to win some of the cards back. So long as you can keep moving the cards back and forth with neither side winning, you will be able to continue earning points. To do this, it is recommended that you keep one of the strongest cards (such as Judge Hog or Ylana Skyfire) in your deck, even if you're intentionally letting Zenco take cards. You should also keep in mind that you can use the Wildcard at any time during play, regardless of whose turn it is. Play on Hard difficulty to maximize the number of points received. Remember (or write down) the median and highest numbers of each attribute. Try to keep the strongest cards, like Judge Hog or Ylana Skyfire, in your deck. The winner of a tie-breaker will receive all currently tied cards. Keep the game going as long as possible to achieve a high score. You can play the Wildcard at any time, once per game. This page was last updated on May 7, 2018.